Page Builder: Visual Composer â€“ Visual Composer is an easy to use drag and drop page builder that will help you to create any layout you can imagine fast and easy â€“ no programming knowledge required! 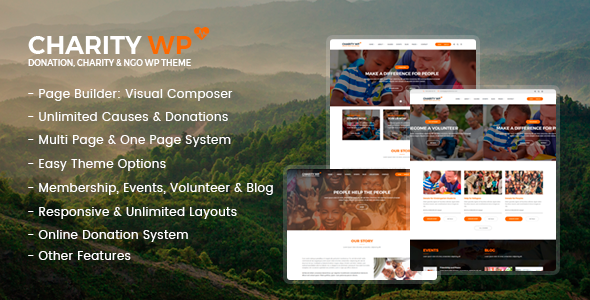 Theme Options â€“ An easy way to customize your theme. They allow you to build custom sites without touching a line of code. Theme Options has many advanced features with well placed hooks and filters to adjust every aspect of the user experience. Create Sidebars / Unlimited Sidebars â€“ You can create the custom sidebars. You can re-order with drag & drop. General Sidebar Positions â€“ You can select the sidebar position of categories, posts, pages, tag, author, search, archive and attachment (Left, right or no-sidebar). You can define special setting for each post, page and category. Or you can change all settings as general at one time. Sidebar Select â€“ You can set the specific sidebar for categories, posts, pages, tag, author, search, archive and attachment. Fixed Sidebar â€“ You can active/deactive the fixed sidebar. Blog/Archive â€“ You can set the specific elements for categories, posts, tag, author, search, archive and attachment. (You can active/deactive the elements(author name, date, image, social media etc) for categories, posts, tag, author, search, archive and attachment). Pages â€“ You can set the specific elements for pages. 404 Page â€“ You can set the specific elements for 404 page. Loader â€“ Enable or disable loader status. Header Alternatives â€“ You can set the specific header for categories, posts, pages or general site. You can define special setting for each post, page and category. Or you can change all settings as general at one time. Header Status â€“ You can hide the header for categories, posts, pages or general site. Header Logo Customization â€“ Logo upload, height and width size and other settings. Footer Status â€“ You can hide the footer for categories, posts, pages or general site. Colors â€“ Personalize your theme color as desired. Personalize color as desired for headers, navgation, blog, pages elements, footers, elements and other full layouts. Custom Backgrounds â€“ You can set the custom background. Typography â€“ The web is first and foremost a typographic medium. Because of that, we wanted to ensure that the level of control over your siteâ€™s typography was unparalleled in any other WordPress theme on the market. More than 700 Google Fonts! You can set the fonts of headers, footers, posts, page element and other settings. Enable custom fonts and their subsets if desired. Social Media Links â€“ You can set the social media links. Profiles for Facebook, Twitter, Google+, Instagram, LinkedIn, Vine, Pinterest, YouTube, Behance, DeviantArt, Digg, Dribbble, Flickr, Github, Last.FM, Reddit, SoundCloud, Tumblr, Vimeo, Medium and RSS. Social Share â€“ You can set the social share buttons. Site Icons â€“ Favicon, touch icon and icon customize. WooCommerce â€“ You can set the sidebar positions, product column, layout select and etc options for WooCommerce.